Under Armour earnings for the fourth quarter of 2018 has UAA stock heading higher on Tuesday. The Under Armour (NYSE:UAA) earnings report for the fourth quarter of 2018 starts off with earnings per share of 9 cents. This is an improvement over the company’s flat earnings from the fourth quarter of 2017. It was also good news for UAA stock by beating out Wall Street’s earnings per share estimate of 4 cents for the period. Under Armour earnings for the fourth quarter of the year also have it bringing in net income of $4.23 million. This is better than the company’s net loss of $87.92 million reported in the same period of the year prior. The most recent Under Armour earnings report also has the company announcing an operating loss of $10.45 million. This isn’t as wide as the athletic wear company’s operating loss of $37.09 million from the fourth quarter of the previous year. Revenue reported in the Under Armour earnings release for the fourth quarter of 2018 was $1.39 billion. This is an increase over the company’s revenue of $1.37 billion reported during the same time last year. It was also a boon to UAA stock by coming in above analysts’ revenue estimate of $1.38 billion for the quarter. Under Armour notes that its revenue in North America was down 6% in the fourth quarter of the year. However, its total revenue still got a boost from a 24% increase in International revenue during the quarter. UAA stock was up 6% as of Tuesday morning. 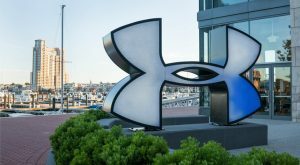 Article printed from InvestorPlace Media, https://investorplace.com/2019/02/under-armour-earnings-sends-uaa-stock-up/.